Let me get the none memories stuff out of the way first. The next two paragraphs should do that and what follows will probably get me out of trouble with the Cluff police. It’s banter Paul. Banter. 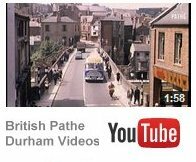 I have noticed a couple of outbursts in recent years that express the view that, to paraphrase: Ushaw Moor is a freegan excreta hole. That is a gross misrepresentation of the village. I can only speculate that such outbursts may be a symptom of frustration; after all there is a lot to be frustrated about if you are down on your luck in this society. I don’t feel especially lucky at the moment. To use a football analogy, I feel as if I am part of an away team, playing Liverpool, that is 3-1 down with twenty minutes to go. Why is it so grim? Well during the last twelve months three members of my wider family have died and three others, that are closer to home, have suffered significant health set backs. Additionally and perhaps understandably, I have insomnia, but I’m working on that. I have come across an excellent account that relates to New Brancepeth of 1938 vintage. It is essentially about the opening of the village nursery school but there is much more to it than that. By reading it you can get a 1938 feel for not only New Brancepeth but also Ushaw Moor. It is a thesis by John Robert Bell [no relation] and all you have to do is google his full name and the word e-thesis. There are other word variations that work just as well. Page 235 onwards is the relevant bit.You can scroll down to it in a jiffy. I hope you enjoy it. Remember, it is copyright.